Yeah, but: Who needs a test ride? The Long Version: I hate shopping, but I like buying, and enjoy doing research. Going into a store and being lost and uncertain bothers me - it makes me feel lost and uncertain. But in this brave electronic internet world, there's lots of information and options available, and I feel right at home with it. Buying a bike is always an interesting experience. My first bike (as an adult capable of making purchasing decisions) was picked out of a lineup at a manufacturers warehouse sale. I knew nothing about it, but it turned out pretty well. It was a mountain bike, pre-suspension era, and it was blue. After some time, I decided to get more serious, and bought an exotic road bike. I lusted after it for months before I bought it, and although I flirted with a couple of others and went on some test-rides, my original this-is-better obsession held firm. It was a great bike, too. It was heavier than comparably priced road bikes, but had full suspension, and riding it felt more like flying. The only place where you'd be likely to see one is at a triathlon, and even there they were serious machines. They're even more exotic now, since the company now only makes bike racks, so so much for that. It's been many years since I've actually ridden a bike, and a year since I finally sold my old racer. Cycling had stopped being fun; the skinny road bike needed the fancy shoes and wardrobe, which turned transportation into a special event, and the mountain bike somehow never took back its primary role. I was obsessed with being Serious and somehow, even when I realized that the mountain bike was just more fun, it wasn't enough. And getting bikes in and out of the house / up the stairs / on and off an elevator was just a hassle, and then where do I store the thing? Now I've had several changes that put me into a better frame of mind. I've stopped taking myself seriously, and learned to slow down and be less competitive overall. (Riding a scooter is good for that.) I'm happier and spend less time working, have tremendous support at home, and live in a much more bike-friendly area. And with the BMI steadily trending upward, it was time to get back into the only physical activity that I actually like. It was time to have a bike again. Shopping for a bike took weeks of varying levels of intensity. Sometimes I was just idly thinking about it, other times I was staying up late to read just a few more reviews. What I was looking for was a bike with small wheels, making it easier to use the elevators and navigate halls and doors. Folding is an asset - and practically assured with the 20" wheels - but I just want one that can be folded for winter storage, not necessarily the ability to hop on and off crowded trains or take it into stores on errand runs. Fenders and a rack are a hassle for small wheels, so having them included with the bike is a bonus. Suspension makes life more pleasant, and I want decent tires that can take a pothole or two. Riding my Xootr scooter needs constant vigilance to avoid pebbles, twigs, and cracks in the sidewalk, so I really want a bike that doesn't have racer-skinny sneakers. There are also some hard-packed dirt trails nearby, so some off-road versatility is also on my list. Research on the internet is a funny thing. Manufacturers sites are great for specifications and publicity photos, but they're low on real-world perspective. Consumer aggregate sites, with their pro-con lists and star ratings, encourage short-form reaction but there's not enough room to develop a narrative. The source I found most useful are the blogs where people write about their own stuff. That's actually a little scary, because I know someone who writes one of those, and it just shows me that anyone can be an authority. So as with everything, it's reader beware, and just because Google ranks it on the first page doesn't mean it's been peer-reviewed. But with that in mind, there's a lot of good stuff out there, and I've enjoyed being the reader for a change. At various points I had decided for certain on four different bikes. I've liberated their publicity photos to create the nightmare of a mashup that forms the illustration for this review. 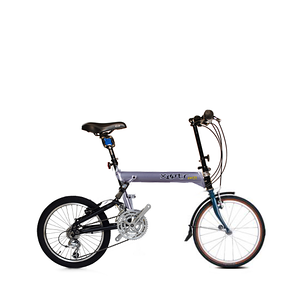 There's a Dahon, which contributes the front wheel, fork, and fender; a Bike Friday, which provides the seat, seatpost, handlebars, and steeting column; a Xootr, which is the main frame; and an Airnimal for the rear triangle, drivetrain, and suspension. These bikes are all folding designs with 20" wheels, three of them have (or offer) some sort of suspension, and three of them are essentially internet-only in Canada. The Dahon is the cheapest of the four by a good margin, is available locally, and there's lots of them on the streets. Naturally, it's not the one I chose. Eventually it came down to two bikes. They're pretty comparable: neither is exactly perfect, but I could flip a coin and be happy with either one. The deciding factor turned out to be customer service. One would have to be ordered through my local bike store, and they must be too busy to have been able to answer either of the price/availability e-mails that I sent them over the past ten days. The other brand was orderable straight from the manufacturer, and after a very quick e-mail exchange to sort out the shipping options and a small amount of customization, it was done. My shipping notification from the carrier was sent less than five hours after I placed the order. I'm not actually going to say which one I picked, because that's not really the point. It will be reviewed here sooner or later, along with a host of other cycling-related stuff. The purpose of this article is really to consider the process. This is the second bike that I bought after extensive internet research, and the second bike that I've bought without any test-rides, but it's the first time I've done both of those together and bought one that I've never even seen in person. Obviously, if I was a Serious Cyclist I wouldn't be doing this, just like if I was a Serious Audiophile I wouldn't have bought my speakers (An SVS subwoofer and pair of Kef XQ1's) off of the Internet without ever hearing them. I'm not looking for custom or cutting-edge, but I'm also not willing to walk into the store and take what the salesperson wants to sell me. Finding information from a wide variety of sources has never been easier, and with some good insight the inconsistencies can usually be sorted out. I haven't been burned so far, and shopping on the internet is almost a hobby in itself. In a week or two, I'll be able to say whether I'd do it this way again.